Good afternoon! 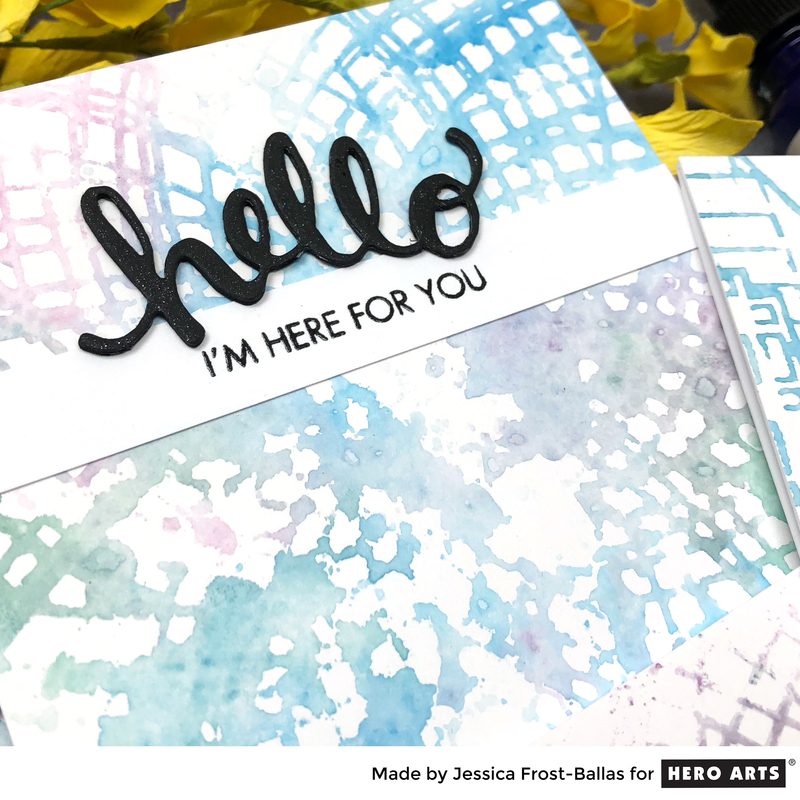 It’s the first Monday of the month which means it’s release time for the February My Monthly Hero kit from Hero Arts!! 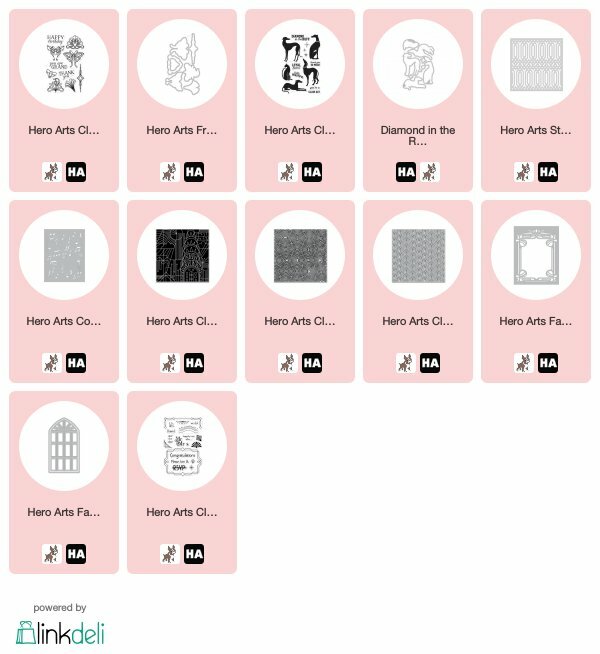 The February kit is now available for purchase at Hero Arts but once they’re sold out, they’re gone for good so make sure to head over and shop soon! The kit value is $72, an amazing deal at $34.99! 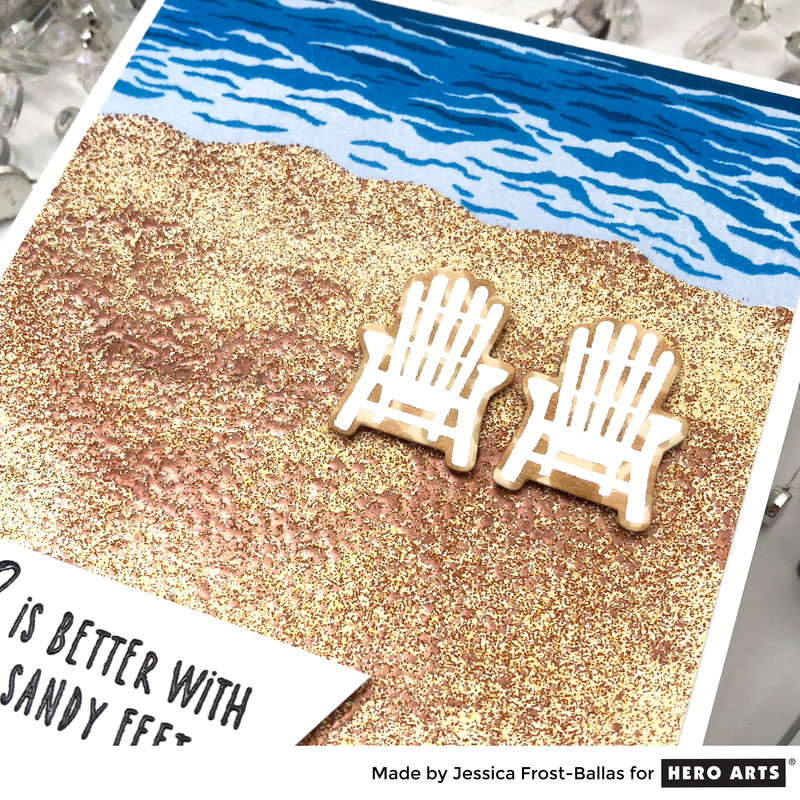 Today I’m sharing a card using one of the add-on sets, Deco-Rations! 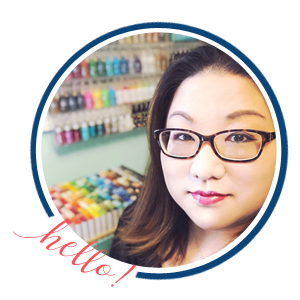 This is one of those times where I wish I could invite you all into my craftroom to see this card in person! It’s so bright and sparkly but it was difficult to capture that in a photo. To start I blended Soft Blossom, Ultra Pink, and Raspberry Jam ink across a panel of strathmore bristol cardstock. Then I stamped the two butterflies from Deco-Rations three times on the panel and heat-embossed them with clear embossing powder. 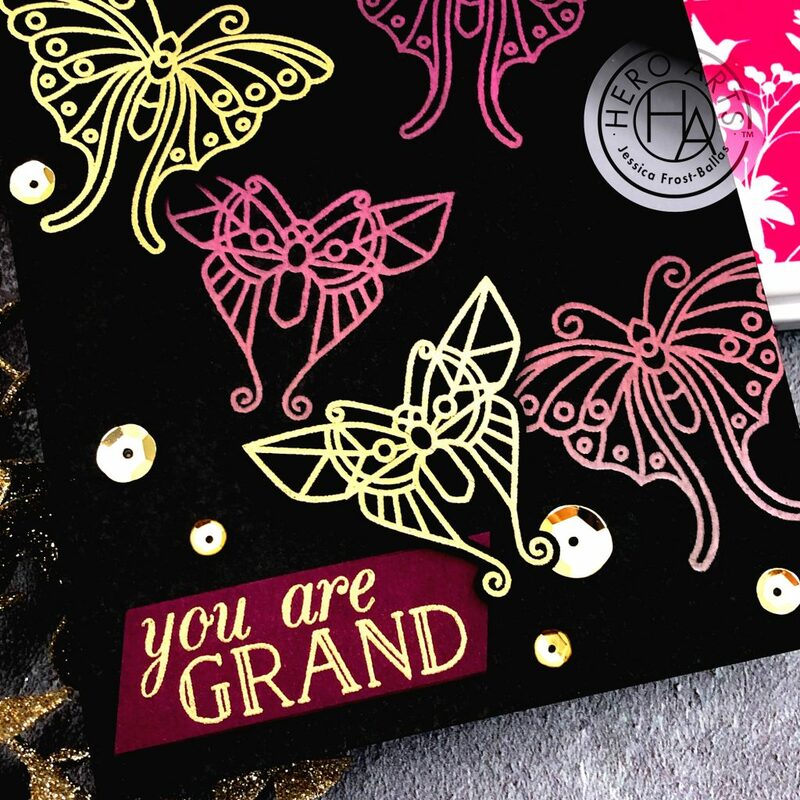 While I had the stamps out I also stamped the butterflies onto black cardstock, heat-embossed them with gold embossing powder, and die-cut them with the coordinating dies. Then I said a quick prayer and swiped my black ink pad across the entire panel until it was totally covered. I took a soft cloth and rubbed the black ink off of the embossed butterflies revealing the pretty ink blending below. I love using the Joseph’s Coat technique but it’s always a little scary to cover everything with the black ink!! Next I stamped the sentiment from Deco-Rations onto a dark wine cardstock, heat-embossed it with gold embossing powder, and then trimmed it down. I adhered it to the panel with regular adhesive and then added my two black and gold butterflies. I adhered the body of each butterfly with regular adhesive and then added foam mounting tape under their wings for a little dimension. Finally I added a sprinkling of gold metallic sequins for a little extra shine! 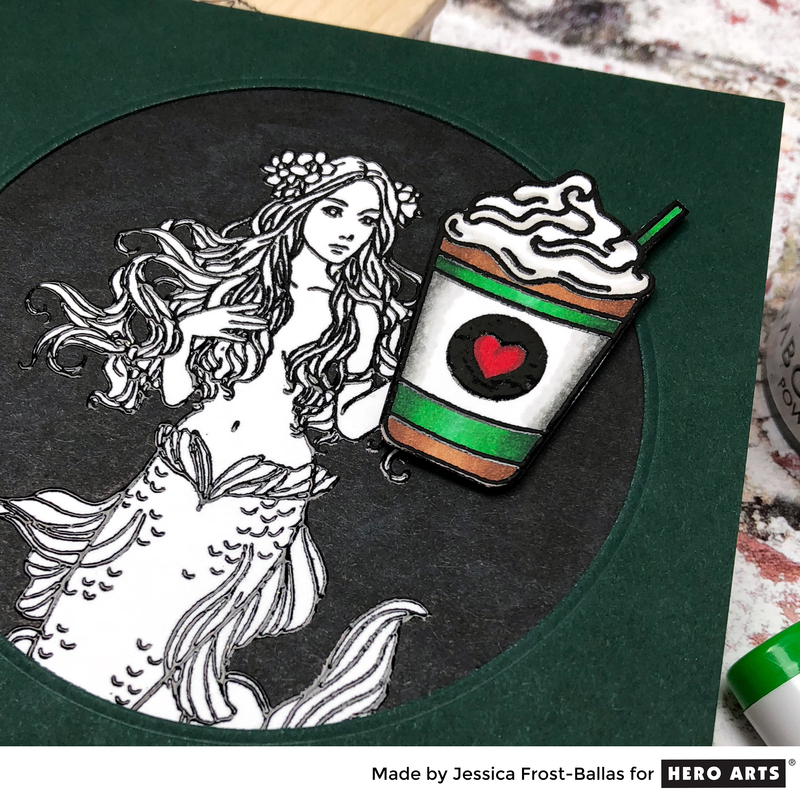 Hero Arts: Finding Inspiration in Unexpected Places! Oh Jessica your card is absolutely stunningly gorgeous. I love the shape of those butterflies & the colours you chose to show them off in. Fabulous. Thank you for sharing your work. Wow – what a kit. Great card! What a striking card! I thought classy and sassy when I saw it. Just awesome! Absolutely love this card! The colours are unexpected but very effective! This is SOOOO SWEET! I love the new kit! It’s a very nice card with gorgeous colors. Love this card – very striking! What fabulous, classy flutterby’s! This is one great kit!! 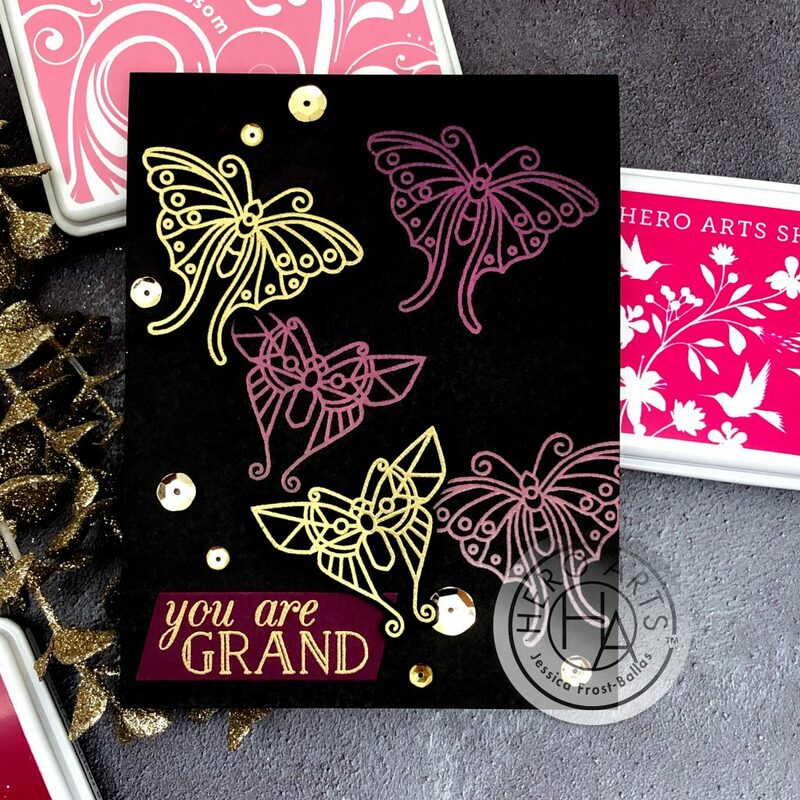 So grand–love the colors and sparkle. 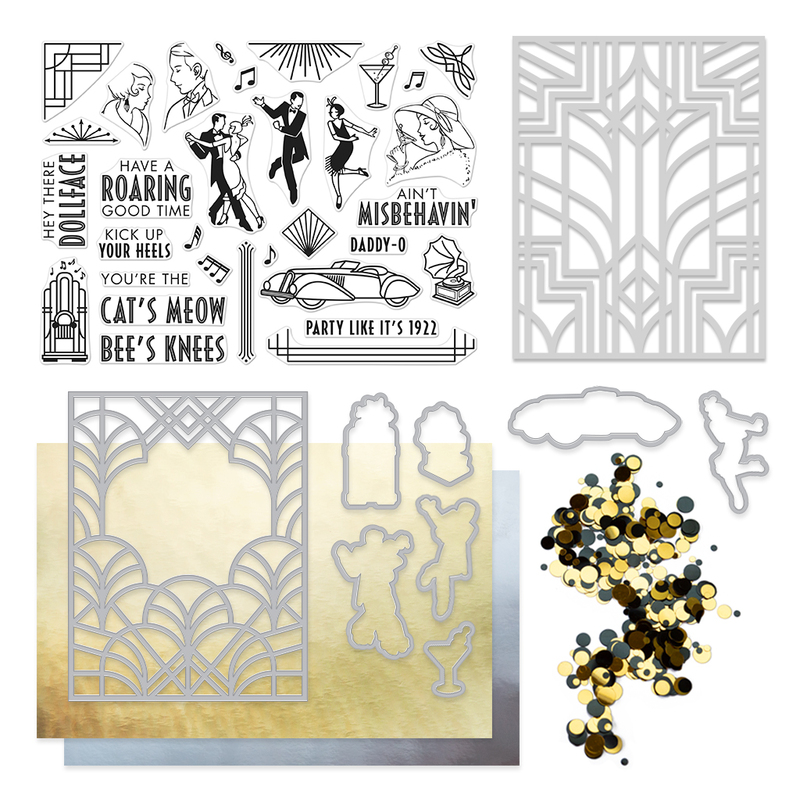 Your art deco butterflies are amazing! TFS! Oh my! Your card is gorgeous! I would love to see a video of this Joseph Coats technique. I will have to search for one after I’m done with this hop. Thank you for sharing!! Wow… what a great technique for stunning effects! The new kit is awesome with unique and fun products. The bees knees indeed! 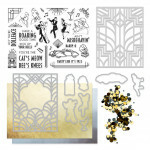 Gorgeous card, but I don’t think I’m brave or skilled enough to cover my card with black ink! Love the technique and results you achieved. Your butterflies are so delicate and pretty. Nice colors, too. What pretty butterflies. I like the sharp edges. Butterflies just make me happy! Wow I didn’t really give the butterflies much thought and I really love them. They are unique and classy. I love the sequins, they are perfect with the butterflies.